It is a truism of self-development that you learn more from your mistakes/failures than from your successes. It’s even better still to learn from other people’s, organization’s mistakes/failures, especially if they follow unprecedented successes. 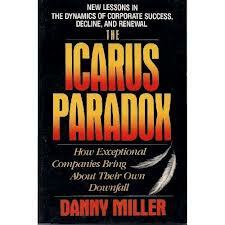 To that effect, Dan Miller, coined the expression “The Icarus Paradox”, for the arrogance of outstanding companies leading to their downfall. The paradox is that your greatest assets, talents, victories, strengths may turn into a liability. In his book by the same name, Miller shows through 4 distinct trajectories how these exceptional companies become their own worst enemy. The focusing trajectory takes punctilious, quality-driven CRAFTSMEN organizations with their masterful engineers and airtight operations, and turns them into rigidly controlled, detail-obsessed TINKERERS firms whose insular, technocratic monocultures alienate customers with perfect, but irrelevant, offerings. The venturing trajectory converts growth-driven, entrepreneurial BUILDERS companies managed by imaginative leaders and creative planning and financial staffs into impulsive, greedy IMPERIALISTS who severely overtax their resources by expanding helter-skelter into businesses they know nothing about. The inventing trajectory takes PIONEERS with unexcelled R&D departments, flexible think tank operations, and state-of-the-art products, and transforms them into utopian ESCAPISTS run by a cult of chaos-loving scientists who squander resources in the pursuit of hopelessly grand and futuristic inventions. Miller, D. (1992). “The Icarus Paradox: How Exceptional Companies Bring About Their Own Downfall.” Business Horizons, Jan-Feb, 1992. These management trajectories applied to self-management may constitute a heuristics of sorts to predict and warn against the seductive influence of our own victories and strengths to lure us into the excesses that may lead to our demise. Keeping with the Icarus metaphor, we must navigate at the just right level of involvement according to our “type”, i.e. not too high not too low. The more we progress in expertise, the more we become successful; the more vigilance we have to exercise lest we become arrogant, a megalomaniac with delusions of grandeur, as the Builder/Imperialist type above, for example. Does any of these trajectories match your own experience? It is less important to find “your type” than to get some insight as to how you defeat yourself, sabotage your own success. What goal, strategy, culture, structure, pattern do you notice you follow and what eventual problems may it bring about? In a more general fashion, arrogance applies to any situation of success that is not well integrated. What is arrogance in this context (as applied to self-development and its tools)? Arrogance: from the latin arrogare; privative a: absence of, without; rogare :to ask, ask for, question, interrogate the attitude of a person who does not ask (herself) any question anymore. This may be because her success and its accompanying feelings of exhilaration has made her discard warning signs of decline on the way or success lures the successful person into believing that she doesn’t need to learn anymore: Hurray! arrived!. Does it mean that we should be weary of success; a most timorous attitude to display when we enterprise, that may push success away, no ? Not so fast. Already in the 80’s, Bandler and Grinder, the creators of NLP, were critical of “success” and described it as a “most dangerous human experience, because it keeps you from noticing other things and learning other ways of doing things.” Consequently, “failure”, or rather ‘feedback’ as they reframed it later, can be seen as an “opportunity for you to learn something that you wouldn’t otherwise notice.” (Bandler, R: & Grinder, J. Reframing: Neuro-linguistic programming and the transformation of meaning. Moab, Utah: Real People Press, 1982.p.33). Of course, it doesn’t mean to seek failure, but rather to make the most of a difficult situation. In line with the Icarus Paradox, success requests that we be vigilant when it happens, and to adopt a beginner’s attitude, as if you were only just starting your journey, to always keep a fresh perspective on things. Sometimes a little artifice may prove salutary. Bandler and Grinder further make the apology of stupidity: “stupidity can be a way to get people to do things for them” or “stupidity can be a way to learn a tremendous amount” or stupidity can be seen as an “ability to ask questions (Bandler & Grinder, 1982,p.60)”. So the antidote to arrogance is to cultivate stupidity, by keeping on asking questions and, shall I add, asking for guidance. Happy happens!